You know that tingly feeling you get when you walk out your door without your phone or keys? You just feel like something is off. That is how I feel when there is no music playing in my classroom. It is eerily quiet and I honestly feel slightly uncomfortable. Even those students that rolled their eyes at the beginning of the semester about having to listen to music in Spanish look around and ask me to turn it on. I love using Pandora because it both introduces students to new songs regularly AND also plays those favorites we've given a thumbs-up to often. Few things warm my Spanish teaching heart more than catching a student singing along to a song in Spanish. The ads in Spanish are a bonus for language development, too! Music complements a foreign language class perfectly because it exposes students to the language and culture in a fun and engaging way. I don't think I have ever met a high student that didn't like music and it provides the perfect backdrop to quiet work time or a lively game. Working on a Cuba unit? 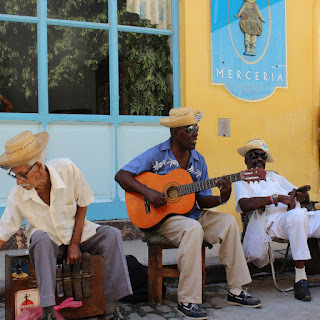 Play Cuban music that week! Kids working on biographies of famous Latinos? Introduce them to influential musicians with a station like Salsa Radio or Buena Vista Social Club. Playing music is a wonderful gateway to discussions on pop culture, as well. Students are always fascinated by what is popular in music from country to country. Wondering how to play Pandora in your classroom? I use this Bose bluetooth speaker (not an affiliate link) and my iPhone to play music since most districts frown upon streaming music on school computers. You'll want to be on wi-fi or an unlimited data plan as you burn through data pretty quickly otherwise. Do you have a favorite station that is not on my list? Please comment with it below! I am always looking for new stations to try. Happy listening! I listen to Juanes Radio, Manu Chao, Shakira, Salsa & Navidad Mexicana! Love this list. @La Senora Straub "Que Vida La Mia" is one of my favorite songs! Thanks for sharing your list. I will check them out! Ooo! Adding Juanes to my list! Thanks! Which of these would recommend for a new speaker? I want to be able to follow the lyrics, so something simple... or perhaps a children song station?